The opinion of drivers and Thonon-Verstappen Face To Face. The only round of the World Championship KZ, that is the most important event for the category with the shift, will take place next 22 September in Varennes. The CRG works team will line up all its best drivers, among which the most victorious driver in KZ1, Jonathan Thonon and the young and strong reality Max Verstappen. We are heading to the heart of the Karting World Championships Season. After the first round of KZ in Brandon (England) – won by Max Verstappen – the most important appointment of the year for the category with the shift, run in a unique race, is approaching fast. In fact, the circuit of Varennes (France) is shortly to house the World Championship KZ1 next 22 September, race that will also see on track the drivers competing in the CIK-FIA KZ2 Super Cup and in the third and last round of the Academy Trophy. CRG, is the most victorious firm competing in the highest category with the shift and in KZ1 it will line up a squad composed by 4 times KZ1 World Champion Jonathan Thonon, this year's European Champion in KF and KZ, as well as in the WSK Euro Series KZ1 and WSK Masters Series KZ2 Max Verstappen, Jordon Lennox-Lamb that is last year's winner of the KZ2 World Cup and WSK Masters Series KZ2, Felice Tiene, who won last year's edition of the World Cup KF2 and ended third this year in the European KZ2 Championship with the victory in the last round of Genk, Jorrit Pex, fresh winner of the German KZ2 Championship for the third year in a row and last year's European Champion KZ1, Fabian Federer who was European Champion KZ3 in 2011, and then again Davide Forè (in force at team DTK) who has been five times World Champion and in 2006 in the category with the shift. Jorrit Pex has also high hopes: “The whole team CRG is very strong this season and all CRG drivers will try to win. In the past few days I have been in Varennes to get to know the track better, in the race I will use a TM engine unit. I believe I run a good test and found a good chassis setup therefore I am 100% ready for this race that is certainly the most important of the season. If I could add the KZ1 World Champion title to my showcase I would have met all my targets in karting”. THONON AND VERSTAPPEN FACE TO FACE. Among all the aforementioned top-drivers, particularly interesting is going to be the confrontation between the most victorious driver in KZ1, Jonathan Thonon, who is hunting his fifth title in the highest category after winning it already in 2007, 2008, 2009 and 2011, and the young but strong reality Max Verstappen, who got all what could be won this year and with a showcase full of good results. The challenge is going to be interesting also considering the history of the two drivers, both grown up within CRG with Thonon (27 years of age next 22 October) veteran in KZ1 and Verstappen (16 years of age next 30 September) at his first year in KZ1 after an one shot appearance last year in KZ2. Jonathan Thonon and Max Verstappen, despite being different in terms of age, experience and character, share the same objective of awarding CRG with another win. We asked their opinion on the coming round of the KZ1 World Championship of Varennes. - You are at the eve of the most important event of the year for KZ. Among the candidates to the title you will find several team mates and, as happened recently in the European Championship, a duel Thonon-Verstappen could take place, which will be an interesting challenge involving the most victorious and the youngest driver. What do you think about this? Max Verstappen: “I have respect for all previous champions, but what matters is here and now. I’m not focusing on the past, so I don’t worry about that. This year I’ve already won the European Championship KZ and KF and of course will also try to win these two World Championships“. - Two different stories: Jonathan is on the hunt for his fifth title in the KZ1 World Championship, while Max is at the first attempt to get it. What is the psychological and technical training you are following to prepare this round of the World Championship? Jonathan Thonon: “I train in the gym everyday but I haven't raced since last June in the European of Genk. I hope I will not have problems to my ribs that are not used to the track solicitation. Fortunately we have a terrific chassis and an engine devised by Tec-Sav that is a new evolution of the Maxter created specifically for Varennes. I am 100% motivated”. Max Verstappen: “I will try to keep Jonathan away from his fifth title, because I want to win my first World Championship KZ. I approach this event just like any other. I’m never nervous and don’t feel any pressure. We have made some progress with the TM-engines and the latest CRG-chassis is very well balanced. To stand still is to go backwards, so we are always pushing”. - How important is this event for you and your career? Max Verstappen: “It would be great to win this title, even if I already had a fantastic year by winning the European Championships and two titles in WSK. I will be fighting also for the KF World Championship but it would be definitely great to win also this KZ World title!" 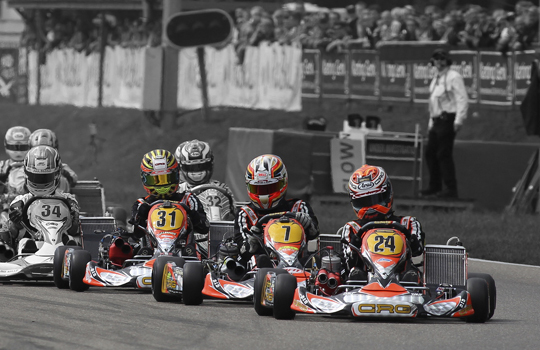 From the left, Felice Tiene, Max Verstappen and Jonathan Thonon at the European Championship KZ 2013 in Genk. An historic image: the very young Max Verstappen, on the left, in his first season at CRG in 2010, together with Jonathan Thonon at the time three times World Champion. Max will be at his first experience in the KZ1 World Championship, Jonathan already has four world titles on his showcase instead. (Photo by CRG Press).